On the evening of 2nd June at around 20:40 we were doing the rounds ie locking up the hens when we stumbled across something hanging off our picnic table and on closer inspection we saw a neat ball of bees. This was our first swarm! It looked amazing. My first thought it must be one of mine, but now not sure. Having not collected one before, we rang a couple of members for advice which was greatly appreciated. 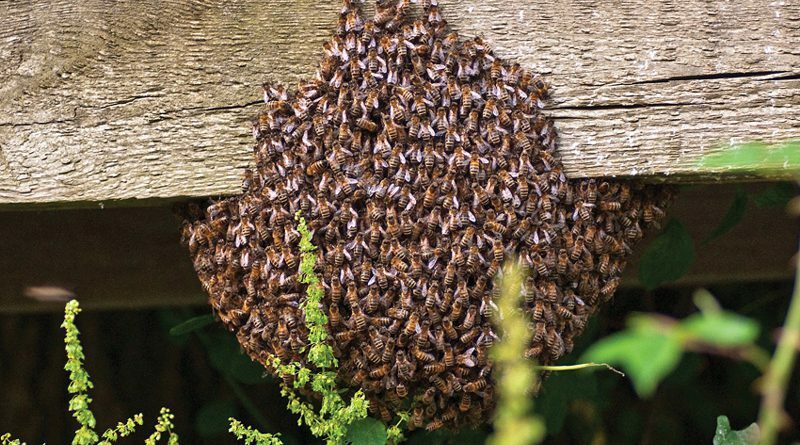 So in the next 10 mins – suits on and armed with an old brood box and a lump hammer we approached the swarm. Box placed under table leg, one large knock on the table and they all fell in, lid on and then taken to a new home. 12th June – swarm opened, queen found and bees drawing out frames at a fantastic rate with the help of some sugar water. All looking good. This was a great experience and with the help of the club members we managed to set up a new hive.